Titus Kaphar is a young and rising artistic star. Named a MacArthur Genius in 2018, he’s making his presence known with his provocative paintings that “revise” canonical ones as he investigates who gets to speak and who gets left out. He’s done a brief TED Talk (about 12 minutes) on the subject. His painting “The Cost of Removal,” a commentary on both the forced migration that resulted in the Trail of Tears and our contemporary immigration politics, is an engaging way into the Conversation on the Statue of Liberty in our 9th grade book Foundations of Language and Literature. In a way, watching this TEDTalk offers two visual texts – the video of Kaphar and the Frans Hals painting he works with. To summarize: Kaphar opens by recounting a story of going to the Natural History Museum in New York City with his two young sons. The statue of Theodore Roosevelt on horseback near the entrance includes two figures, a Native American and African American walking alongside. One of his sons asks why they’re walking when the other guy is riding – and that sends Kaphar into a discussion of representation in art, what it says about who we are, and how it informs and forms our sense of our place in history and culture. This connects nicely to the Conversation in Ch7 on Poetry, “What Does the Statue of Liberty Mean to Us Today?” It’s an especially urgent question these days when monuments of Confederate generals and Christopher Columbus are generating heated debates and often violent responses in communities from coast to coast. And, like all good questions, it asks more than it answers. Kaphar goes on to use the 17th century painting Family Portrait by Frans Hals, asking what we see – and don’t see. So let’s start there. Even before you watch the video, you might ask students what they see in the Hals’ painting. It’s a pretty standard portrait of the time period, clearly a well-to-do family who can afford a portrait and believe they have a rightful place in the history of their time. If students are bored or go right for the technical structure, fine: the point is for them to be surprised by what Kaphar does with this work. Kaphar cleverly paints an additional figure, a person of color, and then paints over the others with linseed oil, pointing out that the figures will not be permanently erased, just temporarily obscured as he makes his point: “this is not about eradication….What I’m trying to show you is how to shift your gaze just slightly, just momentarily, to ask yourself the questions, why do some have to walk?” He ends by emphasizing that he is not advocating erasure but amendment, i.e., exposing and acknowledging what is missing – and then creating art that is “honest, that wrestle[s] with the struggles of our past but speak[s] to the diversity and the advances of our present.” In other words, he’s asking a similar question to the one posed to students regarding the Statue of Liberty. Level 1: Why does Kaphar start with his son’s question about Teddy Roosevelt? Level 2: What point is he making by painting over certain parts of the Frans Hals painting? Level 3: What is the difference between erasure vs. amendment? These questions support students’ learning, as Dr. Ellis says, by “engag[ing] in complex information processing tasks.” If you like, you can press further with the rich rhetoric of this TEDTalk, particularly when it comes to the way Kaphar establishes his ethos: what he’s wearing, his story about his visit to the museum, his backstory about meeting his wife, etc. Even if you don’t want to go into this kind of depth, however, just discussing those three initial questions gets to the main point(s). If you have time, you might look at some of his paintings (e.g. The Cost of Removal and Beyond the Myth of Benevolence) to see how he calls attention to erasure and suggests an amended viewpoint. These activities and discussion Could take one, possibly two class periods before you segue into Langston Hughes and the Conversation in the book. One way to transition from Kaphar to this Conversation is to ask a question on his terms: What would it mean to “shift your gaze” when you look at the Statue of Liberty? What might you see? Or what might you notice is not represented? Level 1: To what extent does the Statue of Liberty represent a belief that you hold about America? Level 2: Is the Statue of Liberty still an appropriate symbol of America? Why or why not? Level 3: What is the value of symbols, such as the Statue of Liberty, to a country or a group of people? How can they also be problematic? The Hughes poem is difficult, and will likely take some time to understand the “shifting gaze” that he offers. Or you might start by letting groups of students work on other texts. In increasing order of difficulty, I suggest the Oral History Remembrances, the essay by Michael Daly, “The New Colossus,” “Black Statue of Liberty,” “Slant,” and “lady liberty.” Students might begin their explorations by asking what “amendment” Kaphar would see each of these writers adding to the symbol of the Statue of Liberty. Of course, there’s much close reading and interpretation to be done as students move toward the summative assessment of the three differentiated tasks that each prompt represents. But Kaphar’s voice offers a pathway there. Take 90 seconds—really, it’s just a minute and a half—and treat yourself to “Words Matter,” a video made by outspoken activist and brilliant filmmaker Spike Lee (and not incidentally, recent Academy Award winner for BlackKKKlansman). The motorcycle roars through the California desert toward the camera; the handsome cool guy skids to a stop, takes off his helmet, and it’s Black Panther star Michael B. Jordan! He looks around at the dystopian landscape, spots some rocks and picks them up: “evil,” “hatred,” “bigotry,” “lies.” He throws them away. Then, he walks (with a map? ), sees a children’s swing set, and finds more words: “courage,” “truth,” “dream,” “love.” These are keepers. Helmet back on. And off he goes. This man has changed the landscape. Punchline: this is an ad for the pricey leather goods brand Coach, part of their #wordsmatter campaign. Make that marketing campaign? And, BTW, that iconic leather jacket Jordan is wearing can be yours for $1400. What’s the purpose (for Lee? Jordan? Coach?) – i.e., what’s being “sold”? How does this video promote Coach’s "strong poetic narrative that speaks to Coach’s values of inclusion, optimism and courage" (according to their web site)? Does this campaign name trivialize or celebrate #blacklivesmatter? If the ad is an argument, what is the evidence that supports the claim? Any logical fallacies rearing their heads? What has been the reaction to this video? It’s very current, and commentaries, especially on social media, are coming in at this minute. This activity alone could lead to some interesting discussion and writing. But those of us who work on The Language of Composition are always looking for ways to connect our carefully curated texts, many of them iconic, to contemporary discourse. So you might go right to the Conversation in this thematic chapter on “The Value of Celebrity Activism.” Adding this video might lead to some fruitful exploration of, first, whether this “advertisement” is indeed “activism.” Does knowing that Lee involved his children, Satchel and Jackson, in the making of the video change students’ sense of the purpose and interpretation? Does knowing that Lee and Jordan, first-time collaborators, chose the words themselves? Another strategy is pairing this – motorcycle jacket and all – with the essay in our Pop Culture chapter “How the Motorcycle Lost Its Cool and Found It Again” by Troy Patterson, a 2015 article on the history and cachet of the motorcycle jacket through the past decades, actually since it debuted in 1928. The questions in TLC3e following the essay lead to a provocative analysis of Patterson’s purpose and style, its structure and argument. (My favorite asks how Patterson supports his claim that “the motorcycle jacket is an international uniform impervious to obsolescence.”) So what does that jacket that Jackson is wearing and Coach selling have to say about our current moment? What if he were wearing an L.L. Bean shirt or a hoodie? Is the moto (as it’s called) code for macho? Power? Taking a stand? If you want to dive a little deeper, add “The New Power Blazer,” a very recent article in Fortune magazine subtitled “How a symbol of rebellion found its way into the boardroom” – via the ladies! Apparently, the new CEOs and captains of industry and Congress, are ditching their blue blazers for swanky black leather motorcycle jackets. Why? Read the article. Is the moto still cool? (or in AP parlance, “to what extent is the moto still cool?”). Do you want one? Why or why not? Or, if you want to get into the rhetorical weeds, then this activity could be just a warm up to reading the superb Central Essay in Pop Culture – “Hip Hop Planet” by the wonderful James McBride. It’s a sophisticated analysis of the history, artistry, and cultural significance of Hip Hop. These are the kind of connections we hope that our selections in TLC3e will generate as you tailor readings to your own classroom. All exam prep need not be, well, totally exam prep. Enjoy! The Education chapter is many teachers’ choice to start off the AP® Lang course, usually after introducing rhetoric in an opening chapter or two. The central text by Fareed Zakaria on the value of a liberal education and the classic work by Frederick Douglass on the vital link between liberty and education are substantial and, certainly in the case of Douglass, challenging pieces. Other Voices offer a range of views on the nature, purpose, and methods of education; the Conversation asks students to weigh in on “The Future of High School.” It’s fairly high-powered and lofty stuff. So maybe before (or while) they take on these texts, they should think about themselves – do a little meta-exploring on how they learn, not to mention what they want or think they need to learn. A NY Times article announced “The iGen Shift” – that is, the generation born between 1995 and 2012 (known alternatively as iGen or Gen Zers). While the article focuses on ways colleges are appealing to this generation, you’ve got them right in front of you: discussing how accurate the article is from their own perspective might be a good way to spark a conversation as part of this chapter. Whether students read the whole article (which wouldn’t take very long), here are a few suggestions to get a conversation going. Laura Pappano, the author of this article, characterized the iGen or Gen Zers as follows: “A generation that rarely reads books or emails, breathes through social media, feels isolated and stressed but is crazy driven and wants to solve the world’s problems (not just volunteer)…” To what extent do you think this is an accurate description of your generation? Pappano cites Ohio State University’s decision to issue iPads to 11,000 incoming students and has begun to design courses that are “iPad required.” Is this a good strategy to engage students? Should it start in high school? If your school already does this (with iPads, Chrome Books, etc. ), what are the advantages and drawbacks? Pappano cites experts who say that this generation was shaped by the Great Recession of 2008 when they saw family members lose jobs and struggle to maintain financial stability. Thus, Gen Zers are “focused on debt and insist that they get skills and experiences that will lead to a career.” Based on your experience and observation does this focus on career skills result in you and your peers devaluing or not caring about the humanities? As you think about college choices, will you look for opportunities to take liberal arts courses? Another characterization of your generation cited in the article is based on research that shows “despite their digital obsession … this generation favors visual, face-to-face communication over texting. They are not always good at live social interaction, but they crave it.” True – in part or whole? One example of a school’s efforts to communicate to the iGen on their own terms is Princeton University’s orientation video for the class of 2022. Based on Taylor Swift’s “22,” the video was directed by a sophomore student. Have a look at it on YouTube: https://www.youtube.com/watch?v=LfjiENw37S0. Is this an effective video to communicate with your generation? Or does it risk seeming “goofy” or “like your grandfather trying to say swag” – criticisms the article cites of adults who think that they’re appealing to the students by being their version of hip. A sidebar to the article describes “innovative ways that some colleges and universities are engaging their iGen students.” Here’s one: setting up a “Stress Management and Resiliency Training Lab… [that offers brief] “sessions where students learn mindfulness and deep-breathing techniques to lower anxiety while hooked up to a biofeedback monitor” that shows how their body reacts to stress. Why do you think this effort does or does not show an authentic understanding of the needs and concerns of Gen Zers? After exploring some of these questions and issues, what advice would you give your school – administrators or teachers – about the most effective way to communicate with, motivate, and engage your generation? Organizational psychologist Adam Grant advises to “argue like you’re right, but listen like you’re wrong.” And he’s not advising our budding rhetoricians in AP® Lang but high powered leaders of business, industry, and government. His message is the same, though: listen to multiple perspectives and listen to learn, even when it’s not what you expect or want to hear. A Grant google will yield multiple books, podcasts, Ted Talks, and publications you’d expect from a professor at the University of Pennsylvania’s Wharton School of Business, but I met him when I watched a Brief But Spectacular segment on PBS. He’s just there on the screen in a gray t-shirt telling his story, yet it’s a terrific little story that demonstrates in its own way the ethos, pathos, and logos introduction in the opening chapter of TLC3e. The bonus is that it strikes the right chord for all of AP® Lang when it comes to paying attention, thinking straight, and listening actively. So, he says: “argue like you’re right, but listen like you’re wrong” – and you might become better at hearing criticism in the bargain. At this point, he’s using logic, logos, and bringing reason into his story. He continues adding some pathos by telling stories about Facebook’s COO Sheryl Sandberg, who, he says is “obsessed with feedback.” (Full disclosure: she’s his coauthor on a recent book.) Anyway, he describes some of her strategies for eliciting feedback, and it’ll be the rare one of us or our students who doesn’t hear some resonance in Sandburg’s behavior. Explicitly, it’s a Brief But Spectacular lesson in giving and receiving feedback; implicitly, it’s a study in that triumvirate of rhetorical appeals. And it’s only four minutes long. Who knows? It might inspire your students to do their own Brief But Spectacular episodes. Sometimes it seems that the only bright spot in March is March Madness, the NCAA men’s basketball tournament that runs for about three weeks, but begins with compelling pre-tournament tournaments. Equal parts bonding and competition, March Madness brings esprit de corps to school and the workplace and even those of us who follow college sports hardly at all join in by filling out brackets and watching the results, if not all the games, avidly. It might not be the best time to think about the question of whether college athletes should be paid—we’re having too much fun—but if you’re looking for an opportunity to practice synthesizing sources, consider assigning an essay in which students are asked to examine the question of whether college athletes should be paid using the sources in the Conversation section of the Sports chapter in The Language of Composition (TLC) 2e or 3e. We have a good suggestion here for how to prepare for that essay and how to engage your students in the sources. This activity will help them understand, appreciate, and use the various arguments in their essay, even if they don’t agree with them. We suggest a Roundtable Discussion in which small groups of students take on the voice of the writer of a piece to which they’ve been assigned. 1. There are 8 selections in TLC 3e and 7 in TLC 2e — each one commenting directly or indirectly on the issue of whether college athletes should be paid — so create groups and assign each group a selection. Give the students time to read and discuss their source. 2. Ask them to be sure they know where the writer stands on the issue of paying college athletes but also to get a sense of the speaker and audience. They will be taking on that speaker’s voice and may have to reconsider audience as they respond to questions. Write an essay in which you consider the pros and cons of President Obama’s suggestion that basketball should have a farm system much like baseball does. That way, everyone not ready to go professional would go to college and get an education. The NCAA should not be the farm system. 4. Give the students time to discuss in their small groups how the writer of their selection would respond to the question of making basketball more like baseball by replacing the NCAA with a farm system. They will prepare their speaking points for their turn at the Roundtable. 5. Sitting around a table, if possible, a spokesperson from each group shares his or her response to the question in the voice and philosophy of the writer, considering audience in the form of the other writers. After each group has shared, the other groups can ask clarifying questions. Since this is a subject that may be dear to the hearts of your students, taking the voice of a writer with whom they disagree can be very challenging. It’s important to remind them of the importance of understanding—and using in their writing—the counter-argument. You may want to try this in a Fishbowl setup, with the speakers in the center and note-takers and observers around the perimeter. The students on the outer perimeter can also provide textual support for the speakers in the center. Try to keep the discussion focused on the prompt, but be sure that the speakers are using information, ideas, and arguments from the text to which they’ve been assigned. This can be a tricky balance, but it will help students learn to use sources to both bolster their own arguments and refute the arguments of others in speaking or writing situations. We’d love to hear if you use this in your class. Don’t hesitate to comment or get in touch. It’s been about a month since we saw you at the annual National Council of Teachers of English conference in St. Louis, Missouri, and we’re already counting the days until NCTE 2018! In the meantime, check out some of this year’s NCTE highlights! BFW kicked off NCTE by sponsoring the Secondary Session Get-Together. The session briefly workshopped how to discuss difficult topics in the classroom and then broke off for the main speaker. Lois Lowry was scheduled to speak, but there was a last minute change and Laurie Halse Anderson stepped in. She gave an amazing lecture on her best seller Speak and what the book means to students, how to talk about it, and why it’s important to discuss uncomfortable subjects with students. Over 200 teachers stopped by the BFW booth to check out our newest books! With our brand new 9th grade Pre-AP® English text Foundations of Language & Literature publishing early 2018 and a forthcoming updated third edition of The Language of Composition containing approximately 40% new content, we proudly revealed our complete Pre-AP® to AP® English program covering grades nine to twelve. If you missed the chance to sample our ELA materials, feel free to reach out to your sales representative. We’re more than happy to help you advance your course! Did you get a chance to meet one of the BFW English authors? Authors, English extraordinaires, and AP® experts John Golden, Tracy Scholz, Larry Scanlon, and Megan Pankiewicz stopped by the booth throughout the conference and led helpful and engaging sessions on Friday, November 17. They talked about how to tackle the threat of fake news in the classroom and how to utilize appropriate sources. John and Tracy helped teachers use nonfiction to support the study of literary texts, and Larry analyzed some of his favorite poems in-depth with a hundred teachers. John also discussed how to utilize documentary film to teach contemporary social justice issues. If you’re interested in the materials for the listed NCTE sessions, email hsmarketing@bfwpub.com and let us know which session materials you’d like to receive. Strategies for Teaching the Real Threat of Fake News Participants received ideas for teaching students to understand the concept of fake news. We analyzed texts to determine “red flags,” supply writing prompts to generate discussion, and share materials and resources for discussing the role of the 4th estate and social media in American politics. The Fiction of Real Life: Using Nonfiction to Support the Study of Literary Texts Too often in the secondary English classroom, we segregate our text types into separate units or we focus on a single work, missing out on opportunities for discovery across modes. This session presented a model unit that uses multiple text types to sustain student engagement. In this interactive session, we explored ways to teach the critical viewing skills students should employ when looking at documentary film. Specifically, we saw how recent documentary films, such as 13th, Baltimore Rising, and True Believers, examined important issues like criminal justice reform, social protests, and our current political landscape. Not to mention, St. Louis had some fun places to visit. The Arch was within walking distance of America’s Convention Center, and there was a giant adult playground at the City Museum for those who are more adventurous! And don’t even get us started on how amazing the food is. Pappy’s Smokehouse, Landry’s Seafood, and Sugarfire are where it’s at! With all the fun we had meeting you in St. Louis, we can’t wait to see you at NCTE in Houston next year! Throughout the fall, we've encouraged you to use the rhetoric from the 2016 presidential election in your classroom. In our author event (watch it here: Balance, not Bias: Maintaining Civil Discourse in this Year's Election), we talk about ways to keep the discussions balanced, and how it is applicable to AP* Language students. This article continues this discussion. What are the pros and cons of discussing politics with your students? How does not discussing politics affect your students' development as a well-informed member of society? What are some more ways to bring politics into the classroom without causing issues? Read more here: https://www.fastcompany.com/3061993/most-creative-people/have-politics-become-so-ugly-that-educators-are-afraid-to-teach… , and tell us how you effectively teach politics in your classroom in the comments! Media -- find clips and transcripts online of the candidate's speeches that Kenton examines. Split your students into groups and assign one to analyze the syntax through listening to the audio, and the other to analyze through reading the transcript. What are the differences in their analysis? If you've done this with your students, let us know in the comments below! Curriculum Connection: Japanese Internment, Reparations, and Otsuka’s When the Emperor Was Divine. 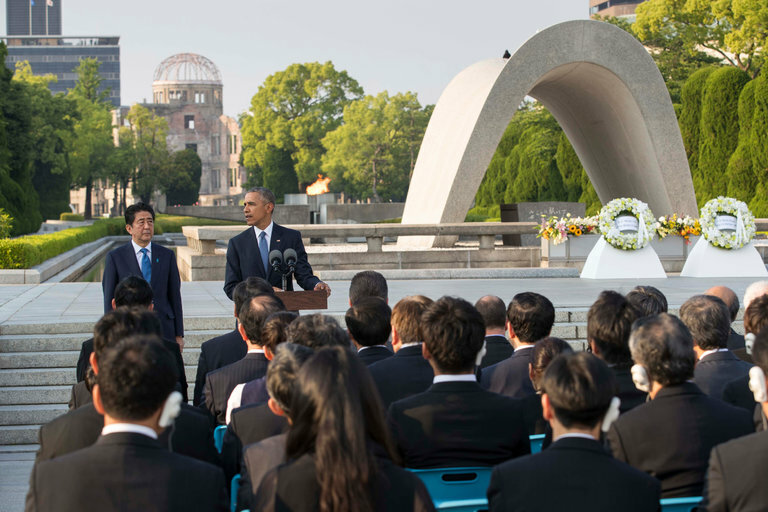 Rationale: In 2016, President Obama became the first sitting president to visit Hiroshima, the site of the first-ever atomic bombing. The visit was monumental in the context of US and Japanese relations, inspiring several books in Japan, including “The Day When President Obama visited Hiroshima,” which details the United States evolving attitude toward nuclear weapons evidenced by Obama’s call for a world without nuclear war within this speech. This speech has many different audiences and makes for a rich cite of discourse. Obama must diplomatically walk the line between a number of historical narratives. He knows that many Americans will be incensed by an apology for an act that they feel saved more lives than it took, while many Japanese citizens will see nothing short of an apology as acceptable. From the perspective of the Chinese Government, Japan was a perpetrator who brought this upon themselves. An apology to Japan before Japan makes redress for World War II, could damage US and Chinese relations, especially considering Japans movements toward militarization. The context of the speech is made even more complex by the bitter irony that the US has seen a slowing in nuclear disarmament under Obama, and Obama has announced plans to spend one trillion dollars on nuclear energy as well as the construction of small nuclear weapons over the next thirty years. In short, this speech makes for a great opportunity for students to look at the implications of diplomatic language. Goal: Students will work to understand how audiences respond differently to the same text based on historical and political context. Academic Vocabulary: Framing, Staging, Atmosphere. Pre-reading: Distribute copies of the transcript. Consider watching the speech with your students. Have them look at a still frame from early in the speech to talk about the staging of the speech and the framing of it. Consider using “Image A.” Who is on Stage? Why? Where are they? Do they notice the ruins in the background? You may want to get familiar with the Hiroshima Peace Memorial. Ask your students to describe how the staging of the speech and the framing of this historical moment develop our sense of the atmosphere. After you watch a few moments of the speech, you might ask them to comment on the sound and atmosphere as well. Check for understanding (Level 1): After vividly describing the bombing of Hiroshima, Obama poses and answers the question, “Why are we here?” What are his answers? Then point out that Obama asks “Why do we come to this place?” and while he provides some answers, they are not the only answers (Be sure to point out that this is a rhetorical strategy. Notice how Obama frames the discourse in a way that is safe for him). Ask students, what may be some other reasons “Why we come to place” that he doesn’t give voice to? See what your students come up with – to seek peace, to mourn the dead… If they don’t get there, explain that many people came to see this speech hoping for an apology. Developing Background: Point out that Obama announced prior to the trip that he would not be offering an apology. Some students may not understand the complexity of an apology from a head of state. See if anyone in the class can explain why the President would not apologize? What would an apology mean? Do a quick temperature check to see if they feel an apology is appropriate. Close Reading: After you establish the central tension of conflicting historical perspectives on the event, namely, an American perspective that the bomb saved more lives than it cost and was a necessary response to Japanese aggression, and the Japanese perspective that this was an inexcusable atrocity, an act of evil. You can ask students, if Obama isn’t offering an apology , then what is he doing? As you read and/or listen to the rest of the speech, ask your students to mark language that seems especially defensive of American policy and language that is sympathetic or apologetic. They should also track points of curiosity and confusion with question marks in the margin. Reading / Viewing: Chunk the text in portions suitable to your classroom and pause to first address any of those points of confusion and curiosity and then to hear the language and arguments that they found either defensive or apologetic. Help them go deeper into these moments. If you’ve taught them the three appeals, ask them to identify the appeals being used in each of these circumstances. For the first chunk, do this as a whole class. For the second chunk, do this is pairs or small groups. After the first chunk, as a class see if you can outline the purpose of this speech. As a class you could try to bring it to a sentence. This sentence can be revised after subsequent chunks. You may also do this as a list. Check for understanding: What does Obama call “Humanity’s Core Contradictions.” Do you agree with the way he framed human nature? Extension: If you want to present the conflicting historical narratives detailed in the rationale of the lesson, you might ask students to keep track of where Obama is making statements that diplomatically address one group or another. Afterwards, you can give students the task of finding an article that analyzes the speech. How was it received in Japan? China? America? Look for both positive and negative responses. In this search, students should identify the evaluation given by the analyst, what details they seized upon in Obama’s speech, and the historical, cultural, or political perspective that the analyst represents. If you are reading When the Emperor Was Divine, you could use this lesson in conjunction with TOPICS FOR COMPOSING: Research / Argument at the end of that section. There, students are given a research task to think about Ronald Reagan’s formal apology to victims of Japanese internment and legislation that paid reparations to survivors. If so, add to this lesson a deeper conversation about why Obama does not offer an apology here. Students should compare and contrast the moral implications of internment and bombing. Our nation has officially decided one deserves an apology and the other doesn’t. Why? Is it citizenship that changes the attitude of the US towards the atrocities? Something else? Do they agree or disagree with the stance the government has taken. Encourage them to use their experience with Otsuka’s text to explain their position. This text also makes an excellent companion to Truman’s statement following the bombing. Use this text after completing the lesson on Truman’s speech. Then complete the lesson outlined above. After both texts have been carefully studied on their own and within their original context, students should be prepared to compare and contrast subtleties of style and tone. List the important shifts in attitude (tone) and perspective. How do your students account for the change in perspective? This may also be a good companion for the Otsuka unit. This week was the first presidential debate; it was schedule 46 years and 1 day after the first televised debate -- the now-famous one between Nixon and Kennedy. Split your students into 2 groups. Ask one group to watch the debate with no sound, ask the second to listen to the audio only while they complete their scorecard. Compare their answers and discuss. Split your students into pairs. Ask one to focus on Nixon, and the other to focus on Kennedy. What are the differences in their scorecard? Ask your students to watch the debate, and write a quick reflection it; then ask them to read this article from the National Constitution Center on how it changed history. Tell them to continue their reflection after knowing more on the history of the debate. Did you use the debate scorecard with your students? Let us know how it worked in the comments! In honor of Banned Books Week 2016, we continue our examination of banning books. Yesterday, we looked at the Banned Books Week 2016: The Most Frequently Challenged Books. Today, we take a look at the history of Banned Books. A quick search of "the history of banned books" brings up tons of resources -- but which are best to use? September 25 through October is the annual ALA Banned Books Week. To celebrate, we'll be doing a post every day this week on banned books. Below is a list from the American Library Association of the top Banned & Challenged Classics. What books have you used in your classroom? Let us know in the comments! This article is a great jumping off point when talking about persona. A social media profile is the very personification of the concept of "persona." Tell your students to examine recent tweets from presidential candidates (maybe without showing which candidate has tweeted!) - what are the differences between the two persona's? Look at some celebrities, authors, and other common figures - what does each their social media say about their personality? Ask your students to think how characters in recent novels would portray themselves on their social media accounts. How does that persona differ from their personality? ● What can lead a utopia to become a dystopia? ● How do you travel ethically? Rationale: After reading the excerpt from A Small Place, the central text for Chapter ten. Invite your students into a story of travel to Antigua that attempts to show how to visit the island without being an “ugly,” unethical tourist. It is an opportunity to practice principles of postcolonial literary theory as well as explore of style and diction shape meaning. Identify the source of the article: New York Times Travel. Written by the travel editor, Monica Drake. Activate prior understanding: What are the purposes of articles in the travel section? Who is the audience of the travel section of the New York Times? Answers: It is written for potential tourists around the world. They may also point out that it is written for travelers, explorers, and travel enthusiast. Ask your students to disambiguate these terms. Are some of these travel identities superior to others? Do some of them THINK they are superior to tourists? Are they? Discuss. Read the first paragraph of “Jamaica Kincaid’s Antigua” where Drake quotes Kincaid, “An ugly thing, that is what you are when you become a tourist…” Hopefully your students notice the irony that this is in the travel section. Certainly, after reading the excerpt from A Small Place, many will. For those who don’t, is it odd to read a travel article about Antigua after reading our central text? Ask students to explain why. Then ask: what is the writer doing here? Does the title of the piece help us understand the writer’s intention? Throughout the article the writer will make many intertextual gestures to the work of Kincaid. Some of these come in the form of allusions. Others will come out through the emulation of writing strategies found in Kincaid’s work. Work with the students to identify the various ways Drake calls to mind our reading of Kincaid’s text. Close Reading Activity: Ask students to read for ways that the writer successful visits Antigua without becoming the ugly thing that Kincaid has warmed us about. As they read, they should mark those places in the margins with a brief summary of what they writer is doing. For example, paragraph five begins with “I explored Antigua.” How is that different from visiting? Touring? What is the writer implying? Close Reading Activity: Close read paragraphs 8 - 10 for language that alerts us to the atmosphere and setting. What do these details convey about the land and its people. Note the contrasting images of decay and abundance. What is implied? Returning to the essential question of “What can lead a utopia into becoming a dystopia?” consider asking students to evaluate the impact of the next “round of change” coming for the island. How are these investment ventures similar to or different from the colonization of the island? Can students point to any phrases that help them understand how Drake feels about the next round of change? This is a great opportunity to point out connections between this text and Kincaid’s text. Example: Note the satirical intent of the line, “To get there, skip the road and land your private jet…” How would we read that line differently if we had a private jet? Broader discussion: how does present the people of Antigua? How is that different from the way the tourist in “A Small Place” sees them? Analysis of Style: As the article concludes, the writer shifts to the second person voice. Read the section again and discuss the impact of this choice. They should immediately notice how this is similar to Kincaid’s piece. Yet, different. Ask your students to evaluate the claim Drake makes, “You laugh when the emcee peppers her monologue with words like “stush” for “stuck-up” and when someone onstage apes a tourist, because that’s not you.” Is she a tourist? If not, what does this article say about ethical travel? How does one travel ethically? This is a good time to check in with the close reading task you gave them at step 4. Make a list of the things she does differently than the tourists that Kincaid blasts. A final point of review may be to recap the various connections you found in style to Kincaid’s piece. Where does she quote Kincaid? Where does she make allusions to language, style, characters, or ideas in Kincaid’s A Small Place? Where does she emulate Kincaid’s style? Other Connections to Advanced Language & Literature: This text could be used as part of the conversation on the Pursuit of Happiness. Many feel luxury and travel are part of the pursuit of happiness. At the conclusion of this essay, the writer seems very happy to not be among the tourists on the beaches or at a luxurious resort. What then is implied about ethical and joyful travel? This could shape an entirely different approach to this essay that looks more closely at family and history.